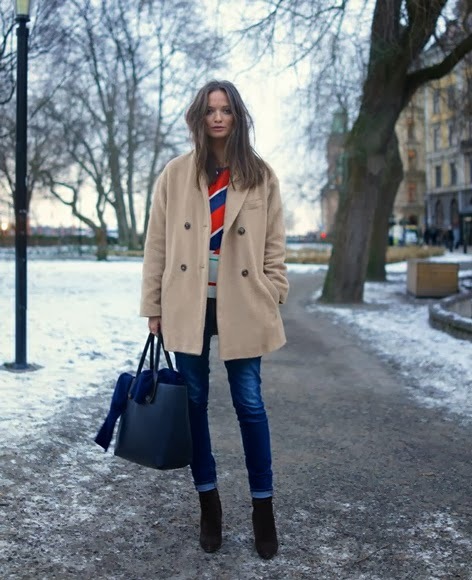 Three days deep into Stockholm Fashion Week, attendees are providing the most inspiring lessons in (freezing) cold weather style. Essentials include a neutral menswear-spirited coat such as this and this (on sale for $78! ), a big chunky scarf, a classic yet standout bag like this chain link Stella McCartney (similar to the ones pictured) and this Saint Laurent mini (pictured below), plus a vibrant/dramatic statement blouse like this or this that pops nicely against heavy outerwear. (The one above is by Celine.) Bring on the cold! Jacket in photo 2 is amazing! Any info on it? I'm vegan and your site is wonderful. You find fabulous items that are both stylish and cause no harm to animals. Everything from Stella McCartney handbags to ASOS coats to Old Navy shoes. Thank you! !